The asymmetrical wrap has been having its day with knitters lately, but this collection of wraps by Hunter Hammersen is the first to really make me sit up and want to knit one (or several). The combination of the shaping, the yarn, the stitch patterns and the design information make this my first favorite book of 2015. I had to look through the book several times to get to everything. First, I was captivated by the stitch patterns and yarns. Every wrap has a textural feeling, even the lace. The combination of yarns and stitch patterns are beautifully sculptural. The photography and the design of the book are stunning. The images and colors are clear and crisp. I wanted to reach in and pet all of the shawls. Most of the wraps are between a scarf and shawl with 40- 48" wingspans and are built on a curly triangle shape. 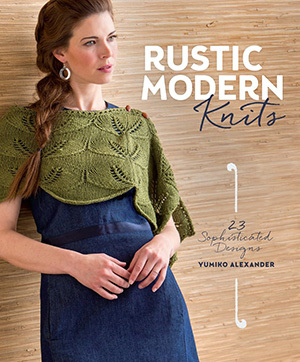 There are 14 wraps in the book and my must-knits are Icterine, Infuscate and Filemot (the cover design). Hunter Hammersen is such a generous clever designer and she explains the construction process of these shawls with such detail and clarity that it's easy to alter the wraps in the book or design your own. This book is an example of independent craft publishing at its finest. 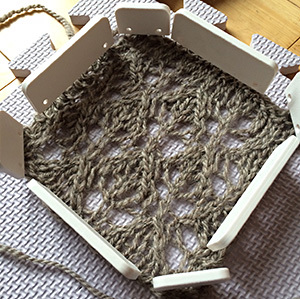 Even though brioche stitch seems to be the knitting stitch everyone is using right now, brioche pioneer Nancy Marchant still manages to make it exciting. She must dream in brioche. She constantly comes up with cool ideas. 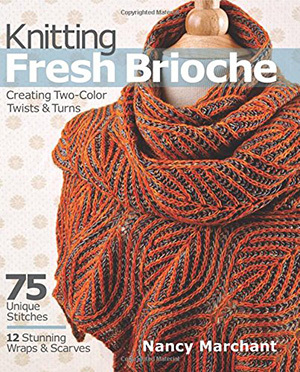 Half of this book is packed with 75 brioche stitch patterns incorporating two colors and lots of motion and traveling. The book starts with just a few pages of basic brioche. If you are completely new to brioche knitting, I highly recommend Nancy's first book, Knitting Brioche, to get a solid base of knowledge before you start this one. The stitch patterns are both written out and charted. Nancy has developed the terminology and abbreviations she uses in her books and they all make great sense. The next chunk of the book is a dozen wraps and scarves, my favorite use for brioche stitch. The yarns and colors she uses for her designs really make them come alive. She uses a variety of gauges for the projects, but my favorite are the designs with finer yarns because they have more opportunity and space for the stitches to travel and the colors to play off each other. The last bit of the book is titled Useful Information and is only about eight pages, but the information here is not to be missed. You'll learn about correcting mistakes, knitting 2-color brioche in the round, converting a 2-color chart to one color (both flat and in the round) and designing your own brioche patterns. This book is an intermediate brioche knitting workshop. These Knit Blockers may make me actually enjoy blocking my knitting. I am not a fan of the pinning, pinning, pinning of blocking and Knit Blockers take a lot of the pinning out of pinning out a garment. 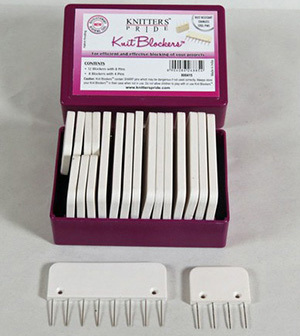 Knit Blockers are a flat plastic rectangle with multiple pins. The small size has 4 pins, large has 8 pins. Blocking swatches is crazy fast with these, and they can be used with blocking wires and can also be used as anchors when using a threaded string to block out lace. These Blockers are very sharp; thankfully they come in a sturdy box. I found that they work best pinned into rubbery blocking squares (see below left). They didn't stand up as well when I tried to use them with a roll-up blocking mat. They would also work great pinned straight into carpet or a futon or non-gel mattress. Knit Blockers were invented by a long-time knitter and they really changed the way I think about blocking. When I blocked a small shawl, not only did it go faster, but the curve was pinned with much more even tension. These are a must for every knitting kit. Pam Powers is known for her knitable, wearable and unique accessory patterns. I was excited to see her first book and it didn't disappoint. The knitting level is just off of beginner through intermediate. There is color work and texture work, interesting shaping and construction. Pam has taken 12 neck wear ideas like, A Study in Lace, Cable Crazy and Neckwarmers, Ascot Style and riffed on each idea two ways. She changes more than just colors between the pair, textures, shaping and silhouettes are changed, but the overall feeling is kept, like fraternal twins. It's a great way to approach a collection. The designs themselves are lovely, varied and interesting to knit. There are several that I read the pattern (yes for fun) just to see how the piece is constructed. The designs themselves are feminine without being too sweet. 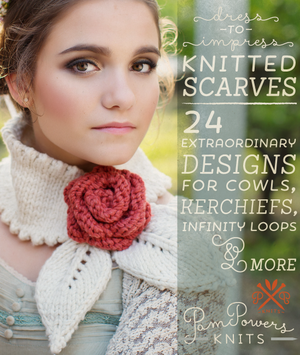 I like how she uses closures like in the Ric-Rac Cowl, the Ascots and the Gingham and Wool Cowl. Another smart style she uses several times is a design that is wide around the neck and tapers to ties. This allows interesting design on the wide part without the whole neck piece being bulky, like in the Bubble Scarf and the Baklava. This is a collection that would be a delight to knit and wear. Knit Wear Love: Foolproof Instructions for Knitting Your Best-Fitting Sweater Ever in the Style You Love to Wear. 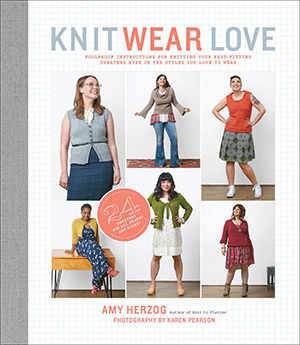 Knit Wear Love is a skillful follow-up to Amy Herzog's groundbreaking, love your body/love your sweaters, book Knit to Flatter. In this well-thought-out companion book, knitters learn about style. What style they feel represents them and how to make it work for their body. One of the great things about this book is that it constrains the potential of overwhelm by offering a defined selection of options. For personal sweater style, your choices are Vintage, Causal, Sporty, Bohemian, Modern, Romantic, Classic and Avant-Garde. For sweater patterns, there are eight base patterns: Pullover, Cardigan, Vest, Cowl, Tunic, Wrap, Tank and Bolero. The magic happens when combining Style, Pattern and adding your body. Amy walks a knitter through the process with kindness and skill. One of the things I enjoy about her books is that she acknowledges the 'ish'. What if I'm between styles, patterns or want a different neckline/sleeve/closure? What if I'm a picture person and not a word person? Before you can ask the question, she answers it. In the Style section, you may choose your style through descriptive words, photos or a quick questionnaire. The entire second chapter -- Sweaters Deconstructed -- is devoted to making adjustments to things like necklines, sleeves, rates of shaping and stitches as well as very quick reprise of the core of Fit to Flatter. The pattern section is like Ann Budd's Handy Book of Sweater Patterns on a quintuple espresso. There are 8 base patterns, each in 12 sizes (in 2" increments) AND in 3 different yarn weights. On top of that, each base pattern is customized to 3 different styles -- a different 3 for each base pattern. Has your head exploded yet? Amy anticipated that might happen and included a worksheet to copy your perfect pattern numbers on (you can also download it from her website). See what I mean? So smart! Don't forget chapter 2. You have the power to mix and match or completely change style elements. Personally I like a bell sleeve, which is Bohemian, on a slimmer silhouette like Modern or Classic. With this book, I can do it in a cinch. 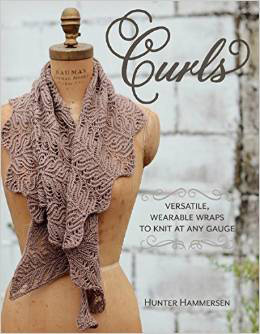 If you don't have Amy's first book, Knit to Flatter, pick that up when you buy this one to get your fit exactly right. The combination of the two will give you a wardrobe of sweaters that glorify you --your style, your body and your knitting talent! Another yarn ball holder? Yup. And this one is a winner. I usually keep my yarn ball in my project bag (I have dozens of different ones) along with my growing project. Which, honestly, works. But not well. A yarn ball needs to flow freely and most project bags have attachments which make them great transporters, but not so much with the free-flowing of yarn as you are knitting. The Yarnit does things differently. 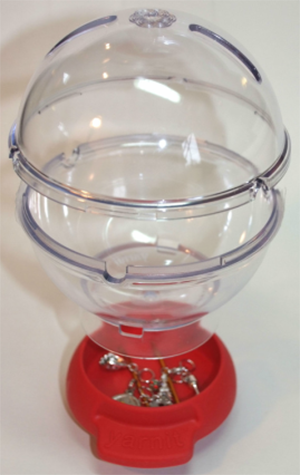 First, you can put your ball inside the clear unbreakable (Lexan) globe and see how much is left with a quick glance. 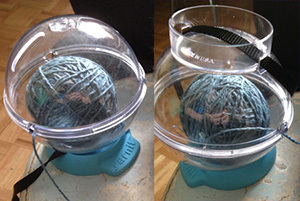 Second, it spins more easily, feeding you yarn without tugging. Both	of	these things are awesome. But what's	with	all the slots and holes? Well, the holes at the side allow your yarn to come out of the ball. The slots at the top are for your needles at rest, if you'd like. Stick them into the slots and into the ball, and walk away without worrying about losing your work. Interesting idea! The two halves of the globe simply fit together and lock with a simple twist. See at left how the globe can sit in the base -- with the flange fitting inside, or with it upwards, which shows you the carry strap (and means you can walk around with it, and then set it on the base...and it will stay put). They suggest you can run it through the globe as well as the way I've done it, but I don't think I want it interfering with my yarn's free flow. `Why a carry strap? Put the strap over your shoulder and knit as you go. But...won't the thing maybe fall apart? Well, I took the strap in hand and whooped the Yarnit over my head, around and around like it was a lasso, for a good 10 seconds. And the globe stayed together perfectly, even with that sizeable yarn ball bouncing around inside it. I think you're safe to walk around with it. The base comes in 4 different colors: purple, pale pink, red and my favorite, aqua. On their site, see pics of the whole shebang in different scenarios including on a plane or in a car. Yup, clever. The base also doubles as a holder for little tools. Since the globe comes out so easily, you could put your bits in there and remove the globe when you need access. The base is made of silicone, which means it can attract lint and stuff. No biggie. Just rinse it off when necessary and pat dry. It's a fair trade for a material that doesn't slip and slide when you put it down somewhere. The Yarnit is a clever, functional product that deserves a place at your side, wherever you knit. Quince&co has a lean, sophisticated aesthetic that I really love. Design elements carefully chosen to best show off their beautiful range of yarns. 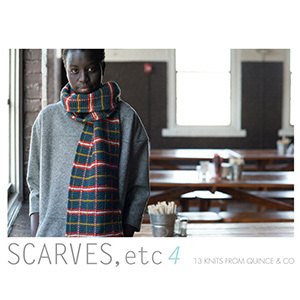 This new collection of scarves is not a book of rectangles with a chart slapped on 'em. It's a collection of carefully, thoughtfully designed accessories, at least one of which will captivate you. Jillian and I both love the Svalbard cowl, a cable-free pop-art creation that uses crossed stitches in an inventive, enticing way. Jane comes off looking like a vest more than a scarf (! ), and the crazy fraternal-twin double-knit Aviary cowl is super neat. There's lots more to love in this beautifully curated, elegantly designed book. Your only trouble will be choosing which pattern to knit first. What makes these accessory designs lovely is the combination of interesting yarns and the ability to be restrained in design. The patterns in this book are mostly understated with patterning in just the right spots. Designer Yumiko Alexander says that she is influenced by nature and I can see that in the flow of her designs. Many are knit at looser-than-ballband gauge to get movement and drape. The patterns are mostly wraps and shawls with a few hats and mitts. They range in look from loose and open to highly textured, compare the flowing Waving Grain shawl to the texture encrusted Hydrangea hat. The designs are quietly stylish -- things to knit in a weekend and wear everyday. I still remember my first ball of Noro yarn. I don't remember the colorway, but remember being transfixed by those long color runs and that the yarn had more tooth than merino. Since that first ball, I have never not had Noro in my stash. I never get tired of looking at the color combinations and I never get tired of seeing what designers come up with using Noro. The 30 patterns in Noro Lace are an excellent exhibition of different-sized lace patterns on long variegated yarn. Some are clear -- both the stitch pattern and the colors -- and some are wonderfully muddled like mint in a mojito. The projects are sweaters, hats, gloves and mitts, scarves, hats, cowls, an afghan and a bag. The designs that particularly caught my fancy are Brooke Nico's Drape Front Blouse, Vertebrae Stitch Afghan by Margeau Soboti, Long and Leafy Cowl by Eileen Ligouri and Faux Cable Mitts by Sandi Prosser. 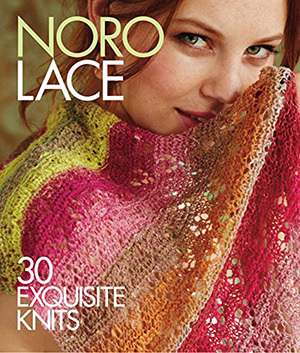 No matter the size of your Noro stash, it's likely you'll find a lacy project that delights you in this book. Are you ready for something new in enrelac? This books starts with a quick reminder of the basic, then shifts into another plane with beads, cables, lace, buttonholes and triangles and star shapes. 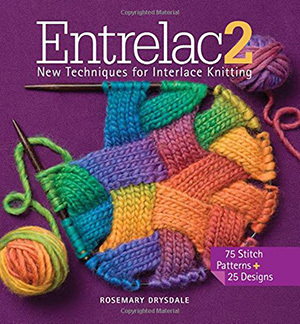 More than half of the book is stitch patterns: a fantastic collection with added colors, lace and cables as part of the regular square entrelac shape. After you've mastered those first creative steps, shaping around the entrelac structure including color, lace and cables happens. Entrelac is shaped into 4-, 5- and 6-pointed stars, zig zags, circles and coils with color, texture and lace. It made my head spin a little with the possibilities. All of the patterns have clear photos of each piece, close up. All of the patterns are written out, no charts, so extra coffee and focus may be needed the first time through the book. The last part of the book works these entrelac marvels into scarves, hats, 3 sweaters, a poncho, pillows, booties and two bags. All are very simple shapes with extra energized entrelac taking the focus. Wool is the fiber that most spinners are comfortable with. We were told when starting out that wool was the easiest thing to learn with and so we got comfortable with wool and then maybe branched out into other animal fibers. Plant fibers can seem scary. We've been told they are too short, too long, too slippery, too strong, and will hurt our hands when we try to work with them. 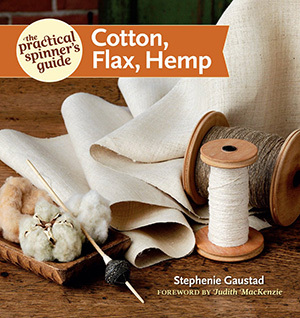 Then along comes Stephenie Gaustad who is a master at spinning Cotton, Flax and Hemp and knows how to use them to their best advantage. Stephenie is aware that many of us are a little nervous about trying these plant fibers, so she takes us by the hand and leads us down the path to new discoveries. I've taken a 3-day cotton class with Stephenie and by the end of it I was a much better spinner in every aspect of my craft. While reading this book, I could hear her encouraging voice coming through. The book covers everything from growing the plants, getting the plant fibers ready to spin, to the best tools for the job, to spinning each fiber type with ease. It is separated into 3 sections, one for each fiber type. Each section moves from one topic to the next in a logical manner. There are beautiful photographs as well as detailed diagrams that will help you see exactly what to do and also inspire you regarding what is possible with these beautiful fibers. One of my favorite parts of the book was Chapter 4, Yarn Handling. This section includes in-depth information about winding tools and how best to use them for these cellulosic fibers. There are pages and pages about how to move yarn from one storage device to another and the benefits of winding and rewinding the yarn before and after the singles have been plied. There is also great information about knitting with these yarns and how to overcome any difficulties such as lack of elasticity and how to finish the fabrics once the projects are complete. And finally, for the weavers, there is great information about what makes a good warp yarn, dressing the loom, what kinds of shuttles and heddles work best with these fibers. Though I think wool will always be my true love, because of this book, I feel more confident that I can make the cotton, linen and hemp fabrics I've been dreaming about. Like every spinner I know I have 4 or 5 different WIP tools and like most spinners I have a favorite. One that I feel is accurate most of the time. I am prone to pulling when I wrap, so I check my WPI several times in a row. This WPI too may have solved my wrapping/pulling inclination. It is built around a dowel so I can roll my yarn on rather than wrap, with only a tiny bit of tension: genius. At the top of the gauge is a slot that will hold the end of your yarn while rolling it on; another smart idea. 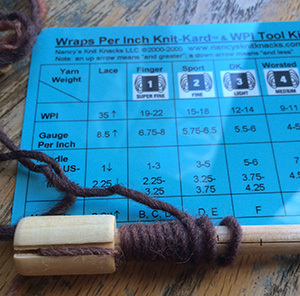 The other part of the WPI Kit is a Wraps Per Inch Knit Kard made up of a chart containing the Craft Yarn Council yarn sizes and corresponding WPI, knitted gauge, suggested needles size and hook sizes. It gives an excellent jumping off spot for swatching handspun yarn. This is going in my spinning tool kit to replace my current favorite WPI tool and I'm not loaning it to anyone, so don't ask. 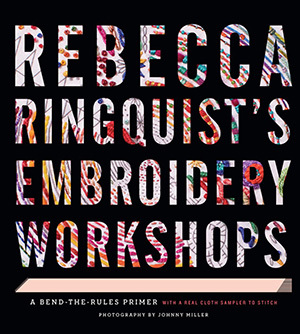 Rebecca Rinquist's mantra for teaching embroidery is "Don't worry, just stitch". This book is like no other how-to embroidery and for that I am very grateful. I learned to embroider from Rebecca a few years ago through her Creativebug class and it was exactly the revelation I wanted. Embroidery doesn't have to be a litany of do this, exactly this way and no knots ever; it can be as relaxed a creative pursuit as I wanted it to be. This book is filled with exceptional teaching and beautiful examples of embroidery, and it opens with a photo of the back of a sampler stitched by Rebecca herself. Guess what it shows? Knots, and threads stretched from one working area to another, not the "back should be as clean as the front" school of embroidery. Rebecca teaches the basics of embroidery stitches using a sampler (included in the book). In her teaching, she takes the rich tradition and history of embroidery in a new modern, relaxed direction. This book is divided into four main sections: Stitch, Trace, Draw and Layer. Stitch breaks down the families of stitches how to create basic stitches and how to make many variations. Trace explains a variety of ways to transfer images to embroider, including the best methods for different fabrics. Draw teaches the basics of mark making, creating original images or lines as a supplement to an existing design or as a freehand design on fabric. Layer explores methods of embroidering over already embroidered fabrics. Each section has several projects designed to instantly try out the lesson taught in the chapter. They range from ones that can be completed in an afternoon to ones that require thought and the possible scouring of flea markets. Highlights for me are the Single-Stitch Patches, Portrait Napkins, Angela's Stitch Doodle Bracelets and the 3D Embroidered Buckle Brooches. The main sections are bookended with a beginning chapter on Supplies, including supplies for machine embroidery and an ending chapter on Finishing: how to mount, frame, stretch and hang your work. All of the how-to is overflowing with step-by-step illustrations and photography. It is abundantly clear what to do and what it should look like when you are finished. The book is packed with beautiful pictures of embroidery, particular stitches, projects to make, Rebecca's mixed media art and all the color and texture of embroidery supplies. It is impossible to look through this book and not want to play along.